It seems like it was yesterday that we were tuning into the weekly review of everyone's favorite good guy, serial killer of bad guy murderer - DEXTER each week on Showtime. It's been three long months since the "darkness inside me - the Dark Passenger" had punched the seasonal ticket after finishing out another season and it's easy to tell you - there is very little in the way of satisfying television programming to fill the void. What ISN'T sparse, is the continual feedback about our DEXTER Podcast, asking us when we're going to relaunch our next effort and continued wisps wondering "if we'd thought about exploring Season 4..." Well the wisps grew to the tune of more than 50 pieces of fan input in the month of January this year and - well - we're ready to pull the trigger here in April, 2011. We at The 2GuysTalking Podcast thought about taking a completely different tack. We WAIT - 30 to 60 days AFTER the films end, revisit the Hype, The Money, The Good, The Bad, a Global Rating and then - the Franchise. The PERSPECTIVE REVIEW. No one else does it. No one else thinks about it and we LOVE being the only program that lives on nostalgia, both recent and even YEARS old. The proof in the pudding? We built our most successful series of Perspective Reviews last Summer with The PREDATOR and PREDATORS Perspective Reviews, and in the Fall with The TOY STORY Perspective Review series (1, 2 & 3). Who knew that a 24 year-old and a 17 year-old movie would have such draw power? This strange ability to harness nostalgia provides us with another great, entertaining and original move starting April 1st! 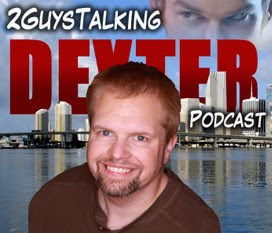 Officially, The DEXTER Podcast from 2GuysTalking will be launching a new, "Perspective Review" of an ENTIRE TELEVISION SEASON - The 2GuysTalking Perspective Review of DEXTER's Season 4! We'll be going back to what is simply the best season of DEXTER EVER, and showcasing, evaluating and reveling in a great story push, stupendous acting and a season that was so good my wife and I watched it in a short 3 days total. Take just a moment to 'Like' the new DEXTER Podcast Facebook presence and stay tuned for the first perspective episode review as the first week of April 2011 arrives and make sure to tell us what YOU think! It's how we built our network and what drives us into more, great content for you the listeners! Man I love Dexter, reading this make me want to go back and re-watch the entire show!! !